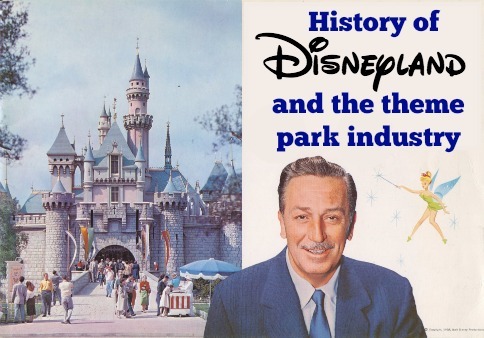 Disneyland changed the world and established an entertainment industry. After a few speed bumps, Walt Disney went on to create the most magical place on earth that we all love and cherish today. Before Disneyland, weekend entertainment involved visiting amusement parks and boardwalks, but Disney changed all that. Most don’t know that amusement parks began as ways to boost usage of other attractions or industries. 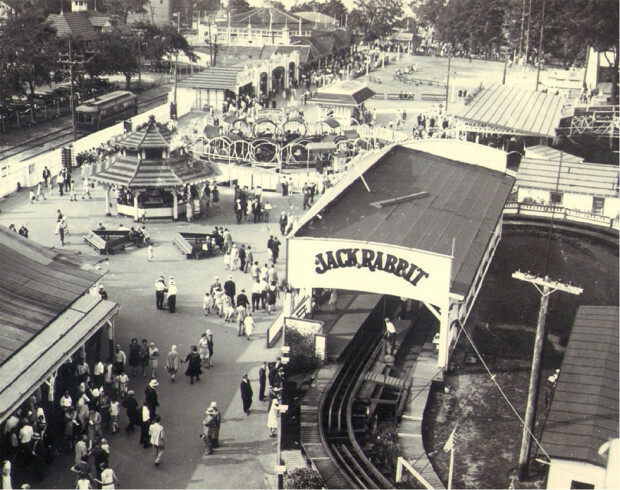 The first amusement parks were Trolley Parks, attractions built at the ends of trolley lines to attract visitors. One of the first was in 1879. These recreation areas featured dance halls, gazebos, and open fields. The Seabreeze Amusement Park located in Rochester, New York. The first attraction opened here in 1903. Gradually rides were added, such as carousels, and switchback railways (these were the first manifestation of roller coasters). At the Chicago World’s Fair in 1893, the first Ferris Wheel was introduced by George Ferris. Coney Island grew from a Trolley Park into a huge amusement park; its size almost doubled when the Brooklyn Bridge was completed in 1883. In 1934, Mrs. Cordelia Knott began serving fried chicken to weary travelers to supplement the family income. This is the same recipe that everyone loves so much today. 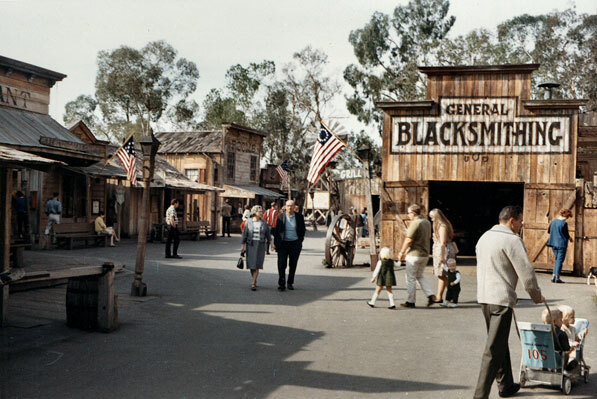 This photo from 1967 shows what the ghost town evolved in to at Knott’s Berry Farm. To keep customers busy while waiting, the Knotts built a ghost town and brought in a mine train for people to ride. It began to develop into a full amusement experience. This roadside attraction is one of the only American amusement parks to survive after World War II. Though amusement parks did very well from 1900-1939 the Great Depression and Second World War hit the amusement industry hard. At the time, amusement parks had free entry, therefore the parks did not make much money, which did not allow for good upkeep. Since there wasn’t any cost to enter these parks, shady characters would roam free and gangs were often present. You wouldn’t want to run in to these shady characters. Would you? During the war many parks closed, because of low attendance and the poor upkeep. By the end of the war fewer than fifty amusement parks still existed in the U.S.
Walt Disney once said, “It was all started by a mouse,” but in reality, Disneyland started with a problem. Sitting on a bench in Griffith Park watching his daughters on the carousel, he wondered, why isn’t there some sort of amusement experience that the entire family can enjoy together? When he looked around for inspiration, he found nothing that met his standards. 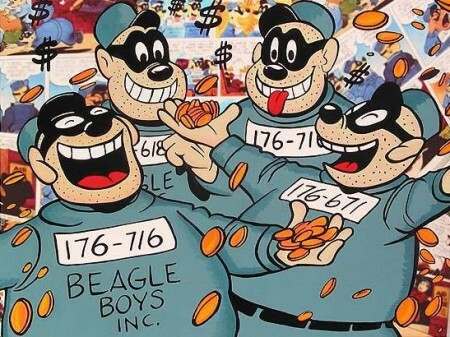 (Maybe he ran in to the shady gang pictured above) Meanwhile, Disney was receiving two kinds of letters from children across the country. Some wanted to meet Mickey Mouse. Others wanted to ride on Walt’s backyard train the Carolwood Pacific. 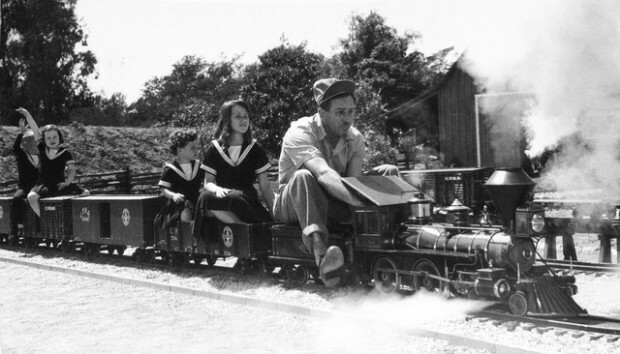 In the early 1950’s, Disney came up with a revolutionary idea: to build a park that was safe and inviting for families while also allowing people to meet his cartoon characters and ride his trains. The idea for Disneyland was a completely original concept in entertainment — one that expanded the Disney brand from the silver screen to a magical in-person experience. When Disney decided that he would be building a place that told a story, he knew that he would need people and technology to help create the magic and tell the stories. In 1952, Disney raised and set aside money to create WED Enterprises, standing for Walter Elias Disney. WED Enterprises would encompass all of the people and technology he had chosen to create his theme park. It consisted of the best of the best from his studio, together with carpenters, engineers, and scientists who would help him create his dream. The division previously known as WED changed it’s name to Walt Disney Imagineering in the 90’s. Disney’s vision was that he would tell the story and his workers would create the technology that would bring it to life. Disney himself loved technology, seeing it as a canvas on which to tell a convincing and magical story. For example, when he wanted to have a boat ride that went through the rivers of the world, with visitors encountering real animals, zoologists told him that this was impossible. So instead, Disney decided to have his team create robotic animals to inhabit his “Jungle Cruise.” In this way, technology at Disneyland was established as a safe and inviting way to help guests immerse themselves in the story — not as a celebration of the technology itself. Walt Disney appeared as a Jungle Cruise skipper on the Disneyland television show. To grow their empire, Disney has brought about evolution of everything from robots to tires. In 1952 Walt started WED Enterprises to create his magical world, and since the parks grew so did WED, or as it is called now, Imagineering. The name came about when Micheal Eisner, the last President and CEO of Disney, said that all WED did was imagine and then engineer things–imagineering. While Imagineering has grown to include more than 150 disciplines and imagine things from hotels to parks, they still do it all to tell a story. One of Disney’s key innovations was the introduction of next generation Audio-Animatronics, robotic creatures that populate most of Disney’s attractions. They can interact with guests and move around the parks. Disney has created numerous ways to get people through the story as they continue to redesign ride vehicles. While Disney and their parks have evolved, so has the technology allowing for the parks to be created and run. In addition, Disney raised money for his Magic Kingdom by convincing consumer product companies that if the public encountered their brands at Disneyland, they would associate those products with the fun they had during their visit. Some of the first companies to sponsor the park were Coca Cola, Swift, Frito-Lay, Pendleton, Gibson Greeting Cards, TWA, and Eastman Kodak. The money provided from the sponsorships were very important as the park cost more than $17.5 million to complete, almost double the original predictions. The tradition of featuring outside brands in the parks continues to this day. In fact, the uber exclusive Club 33 was originally built to court new Disneyland sponsors. Originally, these companies owned shares in Disneyland, but once it started to turn a profit, Disney bought those shares back, until the only owners were the Disney company and ABC. Once the Disney company acquired ABC, Disney and his management team took control over the entire park. By taking control of the park, Disney created a set of standards that are still visible throughout all of the Disney theme parks today. This painting transforms when the lights are turned off. Each light fixture on the map is painted with black light so that this painting can seamlessly illustrate both day and night at Disneyland. Walt Disney once said, “Disneyland will never be completed.” That statement is still true today. When Disneyland opened, it filled 160 acres, and had one park and one hotel. Now the Disneyland Resort fills 510 acres consisting of 2,224 hotel rooms in three hotels, a shopping district, and two theme parks. It employs 20,000 cast members. Since 1955, Disneyland has grown and evolved from a single park into a world renowned resort complex. Many expansions have occurred over the last 55 years, the biggest being the addition of California Adventure and the Downtown Disney District, which nearly doubled the size of the resort. Disney built the new park across from Disneyland in the old parking lot. The new park was themed to California. Since it first opened, California Adventure has been seen as a flop, because of the lightly applied themes compared to Disneyland’s immersive experience across the promenade. But, that will all changed when California Adventure reopened the summer of 2012. 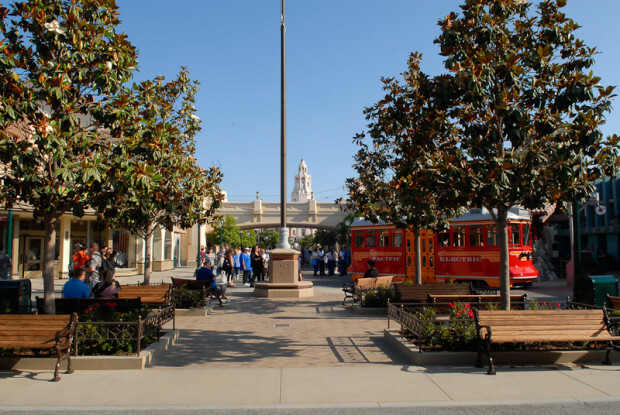 The amazing additions of Cars Land and Buena Vista Street changed the park forever. Not only has Disney expanded and grown Disneyland, they also have created new lands and experiences all around the world. The beautifully crafted Buena Vista Street is now the entrance to Disney California Adventure. 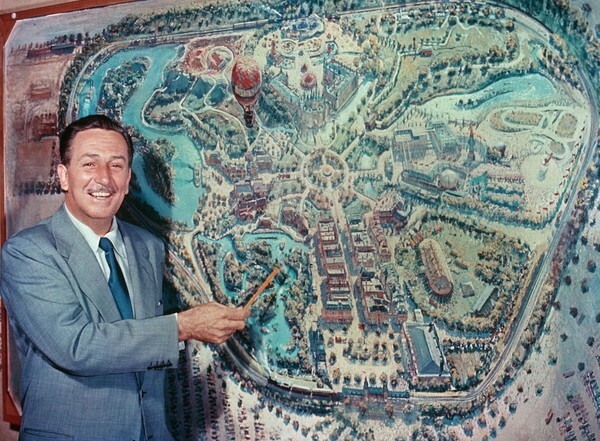 Once Walt Disney had finished opening Disneyland, he began to think of ideas for new concepts. 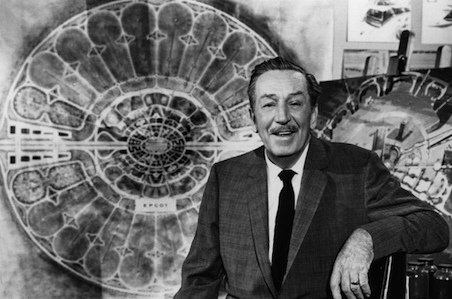 Walt wanted to create an experimental prototype city of tomorrow, or EPCOT. They picked Orlando, Florida for the location of this new venture, and began to buy up land. But when Walt Disney died, the Disney company realized that the massive project couldn’t be completed without Walt’s guidance. This photo comes from the taping of a TV special about Walt’s next project, Epcot. This was last television filming Walt Disney ever did. The plans for an entire city were dropped, and the Magic Kingdom, a park very similar to Disneyland, was opened. After the success of the Magic Kingdom, Disney decided to build a scaled-down version of EPCOT that would consist of an area looking forward to the future and an area showcasing the worlds. In 1983, Tokyo Disney was opened in Japan to appeal to Disney’s Asian audiences. This resort went on to add Tokyo Disney Sea, a park themed to nautical exploration. Disney continued to expand as they partnered with the French Government to create Euro Disney S.C.A., the company that would own and run the Disneyland Paris Resort. 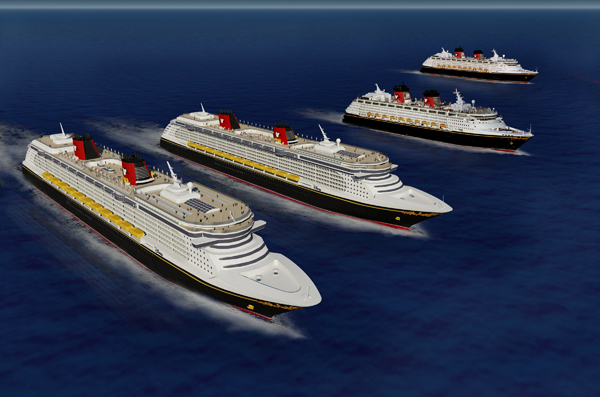 The four Disney Cruise Line ships. 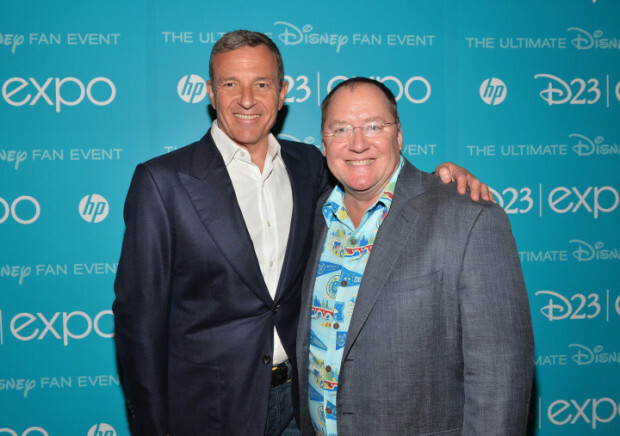 Bob Iger, the CEO of Disney and John Lasseter, the two men currently leading the Disney company. Iger financially and Lasseter creatively. While other theme parks have access to film libraries for inspiration, Disney has television shows, book characters, mobile apps personalities, and one of the biggest, best known film libraries around to feature in the parks. Disney spends large amounts of money on new experiences, marketing, and upkeep. Their parks are geared towards families, and competitors know that. Rather than trying to take Disney customers, competitors like Universal, market to other audiences such as teens and adults. After being inspired by the Trolley Parks and Amusement Parks of old, Disney turned around the revolutionized the market creating the concept of theme park is world renowned today. The Disneyland Encyclopedia: The Unofficial, Unauthorized, and Unprecedented History of Every Land, Attraction, Restaurant, Shop, and Major Event in the Original Magic Kingdom -This book includes almost every name, attraction, and item in Disneyland history with great information. Disneyland Secrets: A Grand Tour of Disneyland’s Hidden Details– This book includes over 150 secrets and stories of Disneyland that come from Cast Member interviews, the Walt Disney Archives, research in the parks, and from other Disney historians. You will love Disneyland Secrets. The Disneyland Story: The Unofficial Guide to the Evolution of Walt Disney’s Dream – This long biography style book details the history of Disneyland with the evolution of the park and the people behind the resort. While is a great read, I do caution you it is a little dense. My advice: Pick up a copy, and read through slowly. Thank you for such great articles! I thoroughly enjoy all the info you share! I have learned so much about Disney and I am simply in awe of your vast knowledge. I have only been to Disney Land twice, once when I was 7, in 1972, then again in 1979. I have wonderful memories that I’ll always cherish. I now live near Orlando and go to WDW at least every other year. I enjoy reliving the magic of my youth by taking my son. So glad I stumbled onto your Disney Dose blog. I hope to return to California and show my son where the magic began! Thanks again! I appreciate your work. Im also looking forward to your Disney Secrets book too!